The Richmond Modern Conference Table and storage accessories are available in several upgraded wood types, laminates, and accent materials. If getting it just right for you involves a certain look, color, or price, you've got options. The Richmond is supported by a radius base in your choice of wood veneer, HPL, or specialty laminate. Select the conference tabletop that best suits your meeting room environment. Inlaid into the conference tabletop are two squares of limestone (other stones available). The Richmond gives you a choice of finish sheen: dull, satin, semi-gloss or high-gloss for wood veneer surfaces. Our design-and-build program is organized around top-quality design and construction, regardless of the materials selected. 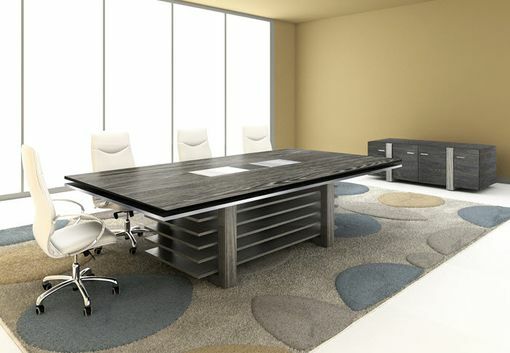 The Richmond table, as shown is designed with a 96" x 42" top with two inlaid natural limestone squares, adding a dash of earth to your modern meeting environment. The table base is presented with brushed aluminum lining its U-shaped base. The deep mahogany finish, against a backdrop of metal and stone, creates an interesting contrast.